The book, originally intended for a general audience (laypersons and academics), ‘was essentially a descriptions of pan-Turkism and the dangers this ideology now poses in the international arena. The publication was later posted at UN Association in Geneva. Despite being an on-line publication, the item has been cited in some academic venues. Robert Olsen’s book has provided details on plans to dismember Iran and has also highlighted how pan-Turkism is being used in this process. (See review of this book by Mainuddin, Rolin. Journal of Third World Studies, Spring 2005, Vol. 22 Issue 1, p287-289 (pdf). To consult this book click here). Reuel Marc Gerecht of the American Enterprise Institute is on record for having said “The Iranians …have terrorism in their DNA”. 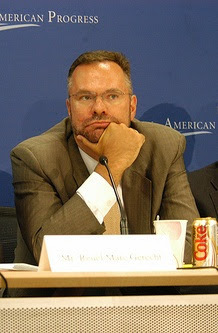 The same Mr. Gerecht has been significantly prominent in trying to stir ethnic tensions in Iran. Gerecht’s role in attempting to foster ethno-separatist sentiments in Iranian Azarbaijan have been noted in the Asia Times article “Stirring the Ethnic Pot” by Jason Athanasiadis (April 29, 2005).